In the classic debate of Superman versus Batman I have always found myself on the side of the Dark Knight. Sure, Superman could easily beat him to a pulp when you think about it realistically, but what’s fun about a super hero who is invincible except for a single weakness? Well when it comes to video games I think a clear winner has been decided. Batman: Arkham Asylum might be the best super hero game ever, while the horror of Superman 64 has forever marred the reputation of the man of steel. 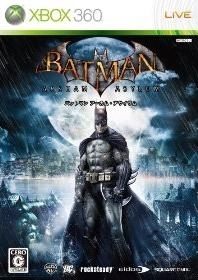 Batman: Arkham Asylum lets you play as the caped crusader during what the developers call “the worst night of his life”. Joker is in custody and you are taking him to Arkham Asylum but things seem off. Batman is worried that something is wrong since Joker was caught too easily; it's almost as if he wanted to be caught. With that glaring foreshadow out of the way Joker soon escapes with the help of Harley Quinn and has taken over all of Arkham Asylum’s security systems. He lets loose the residents of Arkham and suddenly Batman is faced with the likes of Poison Ivy, Killer Croc, and Scarecrow. 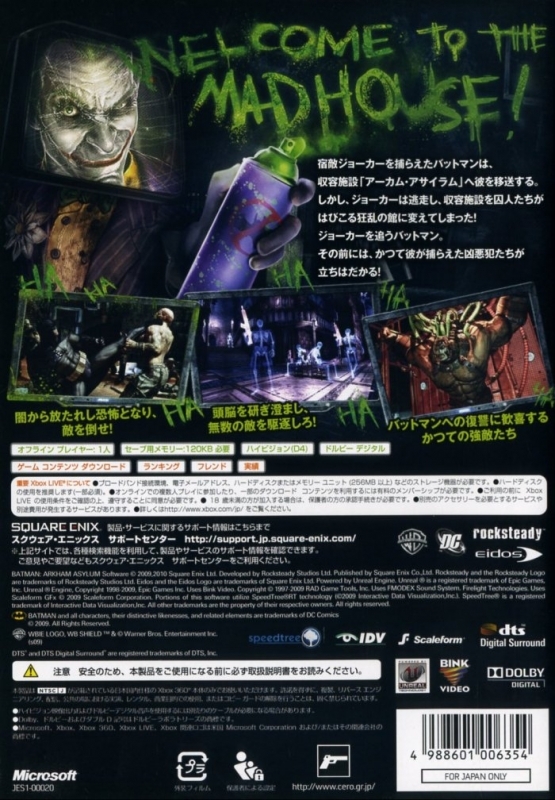 You have to battle all of the released super villains in one way or another, as well as the many minions that Joker has brought along with him from Blackgate Prison, in order to get Arkham back under control. The best part of this storyline is that it seems perfect for Batman. Each super villain tries to fight you with their own specific brand of villainy, which helps to make each boss fight unique. If you got in a fist fight with Poison Ivy or Scarecrow it would not even slow Batman down, so it’s good to see these villains used in a way that is faithful to their characters. One thing that could be seen as a detriment to the storyline is that most of the twists in the narrative are obvious to anyone who has seen the old Batman cartoons, but that's fine since the scenes are still so much fun to watch even if you see the twists coming from a mile away. The story is pretty hard to understand (or at least does not have nearly the same impact) if you are unfamiliar with Batman’s history, as well as the histories of the main villains. 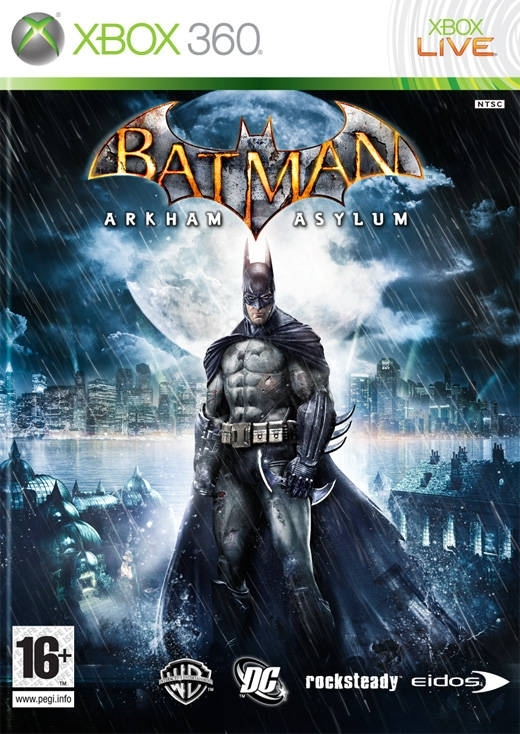 Batman: Arkham Asylum is probably the first game to really make you feel like you are Batman, and a key part of this is how gameplay is split up into three varieties: brawling, sneaking, and exploring. When you are fighting a small group the fighting system can feel fairly shallow. You press a direction and Square/X, and Batman will move towards and hit the person in that direction. If someone is coming at you they will have a blue symbol over their heads and all you have to do is press Triangle/Y to counter their attack and remain unscathed. A combo meter grows as you hit and counter without taking a break or taking damage, and you get bonus experience for the highest combo number you get during the fight. That is right, I said experience. 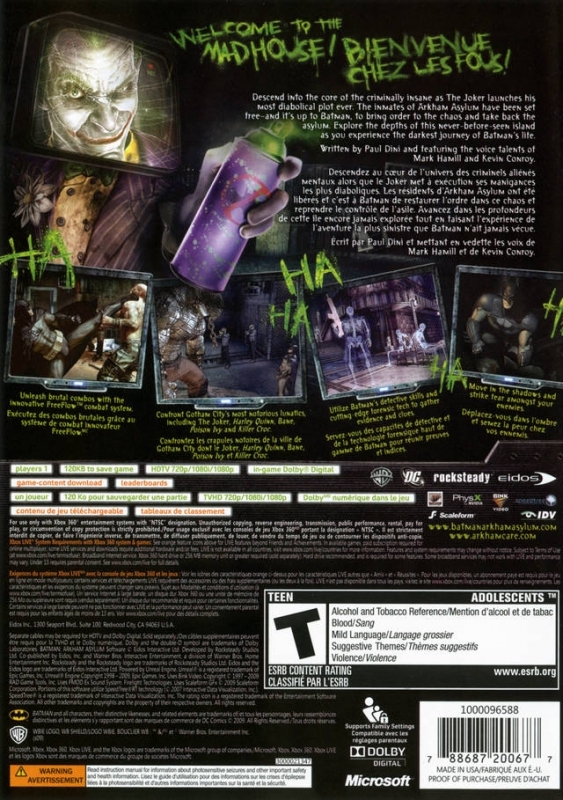 Everything you do in Batman: Arkham Asylum nets you experience and when you level you can unlock new abilities, such as fighting moves that Batman gains access to when you get your combo meter high enough. Fighting really comes into its own when you have a group of ten or more minions to fight against all at the same time and gain access to combo dependent moves. In this situation it becomes a lot less about pressing attack until everyone around you is on the floor and instead you have this extremely fast paced, precise fighting style, and you're trying and go as long as possible without taking a single hit. You are always weighing the options of going for another hit or waiting for someone to counter, but you can’t sit on your laurels too long without doing anything or you will lose the combo. Batman also cannot take a lot of hits before dying, so even if you aren’t going for the combo it is in your best interests to try and avoid damage as much as possible. This gets extremely tough when your adversaries start picking up weapons which you cannot counter, like knives and cattle prods, and you have to quickly remember to stun them with your cape or leap over them to attack from behind, which makes the fighting even more exciting as you try and keep track of the one guy with a knife among a group of 10-15 enemies. Fisticuffs might work great when you are fighting a bunch of fools with pipes, but it won’t help you much against a room full of thugs with AKs. This is where the sneaking gameplay comes in. Not only can you sneak around unheard by holding R2/RT and then silently take down people from behind, but you also have all of Batman’s tools at your disposal. Tapping L2/LT brings up a night vision which lets you see people through walls (well technically you see their skeleton) and tell what kind of state they are in. Play around enough with your enemies and you’ll notice they all start to get freaked out and shoot at anything they hear. Playing with your prey before you take them out is another way this game makes you feel like Batman. The tools you can use help to give the sneaking gameplay some variety since there are just so many ways that you can take out Joker’s minions, whether you use your grappling hook to pull someone over a ledge or booby trap one of their downed comrades with exploding gel. One issue I did have with sneaking was that it was rather ridiculous how easily the enemies would lose you when you went from gargoyle to gargoyle, though this was rectified in later levels. Finally you have exploring, which is made worthwhile by all of the collectables strewn around Arkham. It seems Riddler got free from Arkham long before the Joker and has hidden puzzles for you to solve and trophies for you to find. The puzzles give you hints at what to look for, and all you have to do is scan in that object with the L2/LT button and you have solved the riddle. Most of these puzzles are based around Batman’s assorted villains, with many of the lesser known like Black Mask and Tweedledee and Tweedledumb getting a moment in the spotlight, even if they don’t make an actual appearance in the storyline. Completing Riddler’s challenges gives you access to character bios on all of these villains, as well as some of Batman’s allies, which were a lot of fun to read as a fan of Batman. 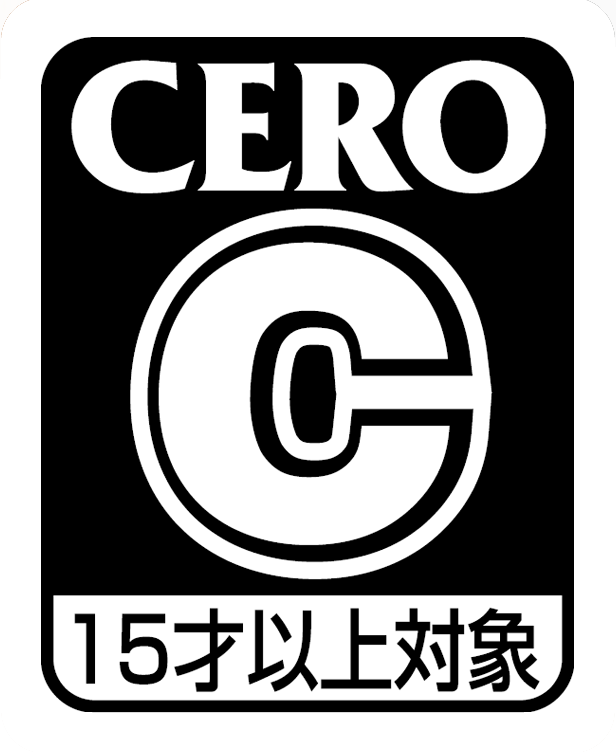 There are also tapes that you can collect of psychological interviews with the game’s villains. Hearing Riddler make a riddle about maiming babies during one of these tapes was one of the creepier moments of the game. Exploration is driven by the equipment you gain as you work through the game. All of Arkham Asylum feels open right from the beginning and you rarely feel like the game’s design is shutting you into a certain space, but your equipment will keep you from going into certain areas. A big part of exploring is going back to every area you have already been to after gaining that latest piece of cool new equipment. There is an obvious logic issue with this set up; why would Batman go anywhere without all his equipment? 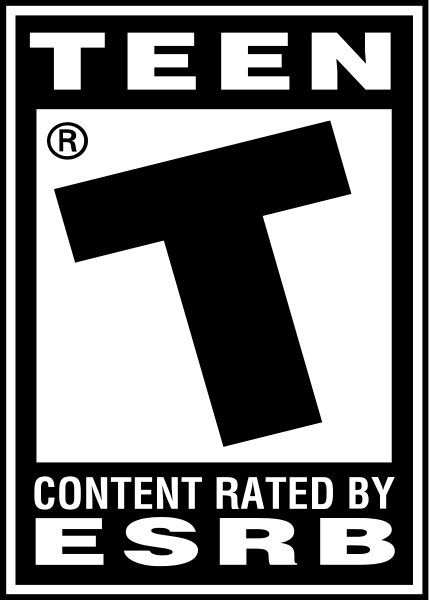 But this is a necessary part of these types of games, so this can be forgiven. The technical aspect of the visuals is probably the biggest disappointment in Batman: Arkham Asylum. Things have a generally muddied look and most of the objects and textures in the game don’t hold up well to close scrutiny. This is counteracted by the style being so perfect. There are fantastic little visual touches that permeate this game and really make you feel like a superhero caught in Joker’s trap. Rocksteady seem to have put a lot of time and effort into the details when it comes to their presentation and I for one am very appreciative. I did notice some texture pop in here and there, and the lip syncing was notably off in sections, but these are minor quibbles. Audio is definitely the high note of this game’s presentation. All of the voice actors from the original cartoon are here and they all sound so perfect. Mark Hamill is definitely the best voice for Joker there has ever been and I hope to hear him take up the role again. I finished Batman: Arkham Asylum in 10 hours while only getting collectables that were in obvious reach during my playthrough. This is a decent length for a game of this genre on normal difficulty. There are also easy and hard difficulties that help add to replay value somewhat. Once you are done with the story mode you can explore Arkham and spend a couple more hours finding all of the hidden treasures that Riddler has left behind. 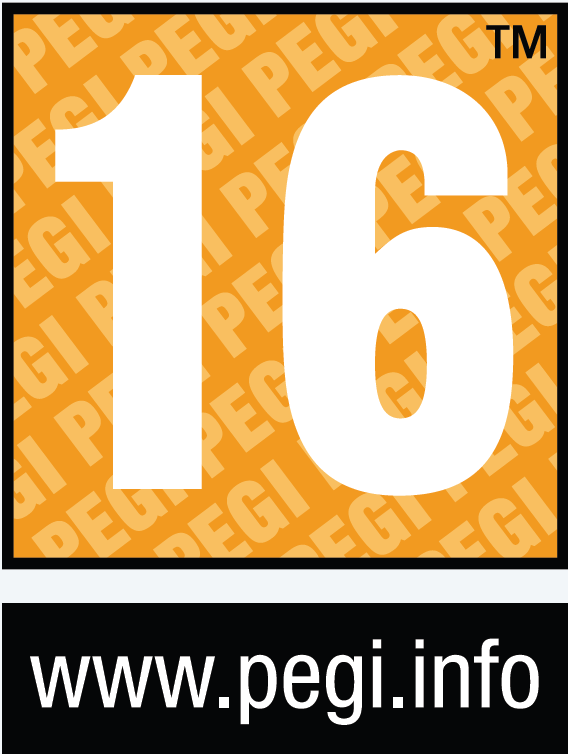 Challenge Rooms are provided as well, which pit you in a brawl or sneaking mission against all challengers. The brawls consist of four rounds of increasing difficulty and you are awarded medals based on how many points you accumulate, which is mostly dependent on your combo counter. Sneaking missions put you in rooms with armed guards and you are awarded with medals based on specific take downs you are tasked with performing. These can be as easy as swooping in and glide kicking a guard, or as difficult as knocking out three guards standing next to three different walls all at the same time with blasting gel. As you complete the story mode and Riddler’s puzzles you gain access to these challenge rooms. There are four brawls and four sneaking missions, as well as more difficult versions of each of these unique challenges that you can unlock. All told the challenges will probably interest you enough to get another 4-5 hours of fun out of Batman. 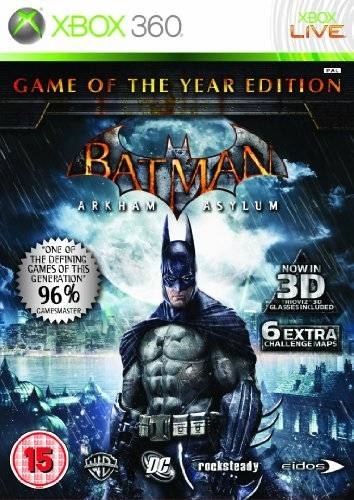 Everyone probably knows this already, but the Playstation 3 version of Batman: Arkham Asylum comes with free downloadable content available at launch that lets you play challenges as the Joker. Just like for Batman you get 4 brawls and 4 sneaking missions, but the Joker does not get any higher difficulty versions of these missions. Joker plays completely differently from Batman and is a fair bit more difficult. You no longer have all of the upgrades you worked for in the story mode, and Joker is more easily hurt in general. He doesn’t have all of the toys that Batman has and sneaking missions are much harder since you cannot grapple onto anything and you only have access to a gun with a single bullet, a single set of chattering teeth holding a bomb, and X-ray glasses. Even the brawls are more difficult since Joker isn’t as efficient as Batman and instead tends to have long sweeping motions to all of his attacks that leave you open to being hit for longer. The Joker downloadable content gives you an extra 2-3 hours of stuff to do and it was surprising how different it was from playing as Batman. 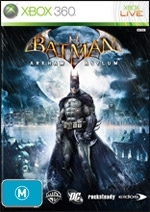 Batman: Arkham Asylum is definitely the best Superhero game I have ever played. I am so happy to finally get to play a game where Batman is treated like Batman instead of just re-skinning a Double Dragon game with Batman and Robin. Even though the recently awarded Guinness World Record of Most Critically Acclaimed Superhero Game Ever is obviously a marketing stunt, it certainly deserves the praise. The story was straight out of the cartoon (in a good way), the action is surprisingly deep and fun, and the audio was on point even if the visuals were a bit wanting. If you are a Batman fan, you owe it to yourself to play this game, and if you aren’t then go play Superman 64 and think about the decisions you have made in your life.